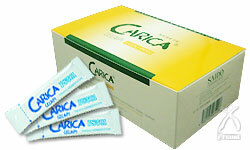 Carica Celapi Ps501 is a 100% natural health food made by patiently fermenting wild papayas. they are fermented and ripened, then dried naturally. There is no process of extracting just one component or chemical treatment. Also there are no additives such as vitamins or calcium. The manufacturing process is natural and holistic. Is a 100% natural food, so from a pregnant woman with confidence to the infants, elderly persons, are available. Carica Celapi Ps501 is a highly popular supplement for keeping up your energy every day.